Do you have a damaged or decayed tooth that needs a crown restoration but you’ve been putting it off because of the time involved? At South Shore Dental Care we are proud to offer CEREC one-hour crowns that fit into your busy life. We’ll repair your tooth with a minimum impact to your life. In most cases it only takes an hour. A crown is a cap that is designed to fit over a damaged or decayed tooth to help strengthen it and return function to your smiles. 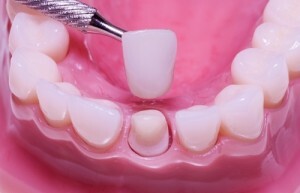 Traditionally, getting a crown was a fairly lengthy process that involved at least two dental visits and requiring a temporary crown while waiting for your permanent restoration to be milled. We know that our patients are busy, so we take advantage of this great CEREC technology that allows us to speed up the process. For CEREC crowns, we take a digital impression of your tooth that’s then sent to an in-office milling unit which will craft your porcelain crown while you wait. This technology also eliminates the need for impressions, which many patients don’t enjoy. Once your CEREC crown is ready, we’ll fit it onto your tooth, leaving you with a completely restored tooth after only one dental visit. Give us a call today to learn more about this technology and see how it can help improve your smile.